I tend to play it pretty safe when it comes to my lip colours. 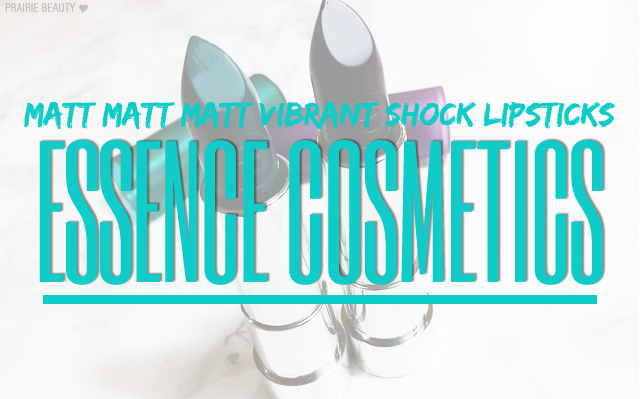 Most days, I'm a pinky or mauvey neutral kind of a girl and when I want something a little more bold, I'm more likely to go for a deep red or a pretty berry shade, so I don't think that I'm necessarily the target market for a line like the essence Matt Matt Matt Vibrant Shock Lipsticks. However, as soon as I saw them at my local Shoppers Drug Mart, I picked up two of the shades because I felt like I just had to have them, and I'm so glad that I did! The two shades I decided to go with were shade 10 No To Mainstream - a really vibrant teal - and 11 Rave It Up - a deep vampy but vibrant purple. Also in this collection were two blue shades, a navy and what can only be described as a bright cornflower blue, but I decided to pass on those because, as outside my comfort zone as the two shades I picked up were, the blues were ones I would personally never reach for. 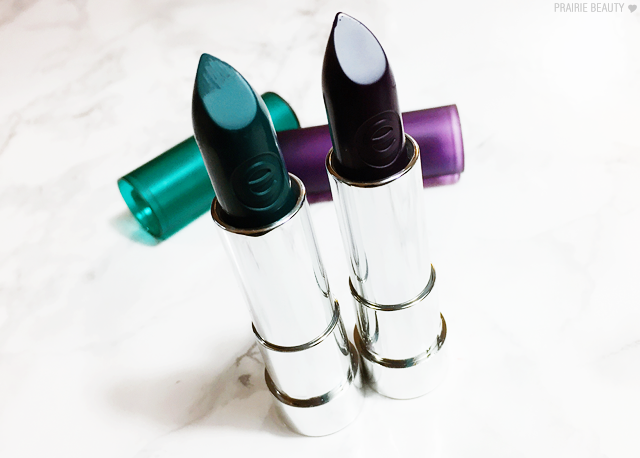 These lipsticks are in the matt matt matt lipstick formula - which is swiftly becoming one of my personal favorites in the drugstore and was a huge selling point for me. 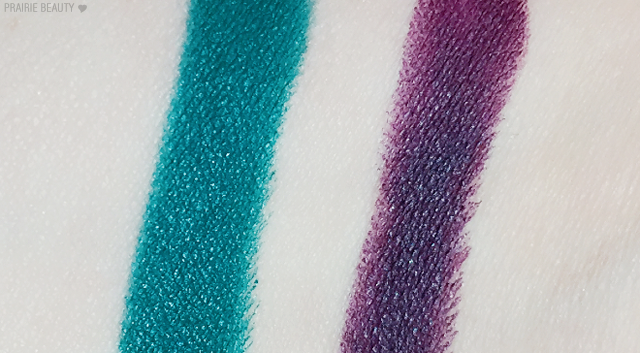 With these really bold shades, I think you need something that's going to stay put and not bleed or move around too much, and I think the matt matt matt formula is perfect for that. That said, I actually found that these two shades really performed differently on the lips for me. I found that when applied to the lips, I got a more uniform coverage from No To Mainstream. It applied really creamy and smooth without me having to do too much work with it, and the formula had just the right balance of creaminess and matte finish. Rave It Up was a little bit harder to work with for me. The shade is gorgeous, but it took a little bit more building up and I noticed that the outer rim of the lips end up coming off a little bit lighter and more pink. This one will definitely require me to find a deep enough lip liner to pair with it. The formula, I found, was also a little bit thinner, with more slip on the lips, which I wasn't a huge fan of. Overall, I think that for under $5 for one of these really bold, edgy lip colours you can't go wrong with this collection from essence. If you're only going to get one shade, though, I would give a MASSIVE thumbs up to No To Mainstream. Not only is it a more unique shade in itself, but I definitely think it has the superior formula and performance. I'm not sure if these are still available in stores, but they are still available on the essence website and retail for $4.49CAD.